The beast behind the sound quality. The sound quality simply can't be compared to any todays modern virtual synthesizers. Altron has a special engine for delivering hyper sound quality and automates every preset to sound its best in any environment. This is all possible because of the Q&T engine which is detailly processed in every sound. From classical to today's most demanding sounds. Each instrument is detailed and manipulated for best results. Switch keys and Smart sequencer will generate chords that compliment each other. 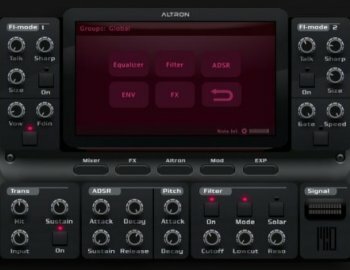 Altron FX is a new generation sound designer with cool effects and controls. 22 special effects with predelay, size, dry & wet. You can easily turn a saw wave into a japanese violin or a live instrument into a future modern sound. This is a library REPACK. All unnecessary duplicate files have been eliminated while maintaining the integriity of the main body of the library. Kontakt 5.8.1 or higher is required! Полноценно на 27 ГИГАБАЙТ КОТОРЫЙ!